NOTE : All NASA photography is copyright free. I am a space geek, this is Apollo 15 during July 26 1971, and ended on August 7 1971. At the time, NASA called it the most successful manned flight ever achieved. I love everything to do with space and its technology especially how on earth they could transmit live video footage from the moon ? The JVC KY1900 as seen below was a cracking camera for its day. 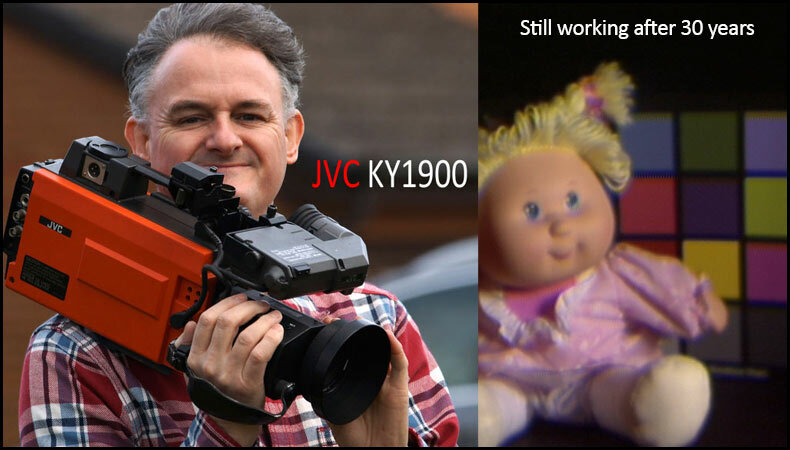 I fell in love with its orange body, I had never seen a brightly coloured camera before, almost 30 years later I bought one on EBAY and to my astonishment it still produced a picture…this says a lot for JVC ! Hands up if you ever used one of these ? 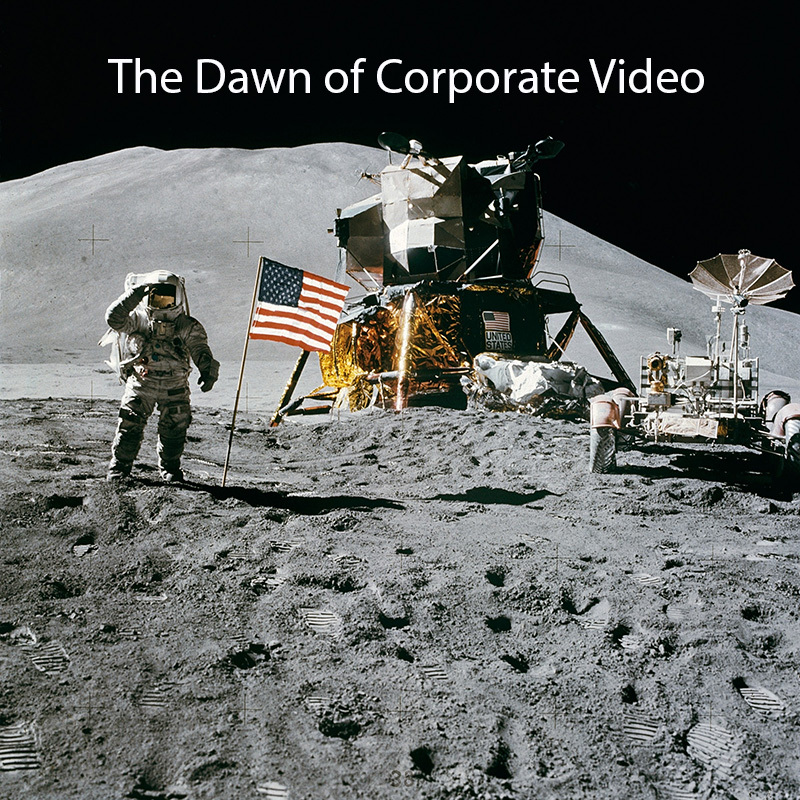 When I started in this business many moons ago I joined a video production company called Flashback Video and they were using two JVC KY 1900 cameras almost identical to the KY 2000 camera (USA version), this was the Dawn of Corporate video production as we know it today. The first professional camera I used in my first job as a cameraman the JVC KY1900. I bought this from EBAY and it still works. My first recollection was at Kelvingrove Park in Glasgow and Chris (my ex-boss) and Ron Seeth were filming a band, I was there in my Radio Clyde capacity photographing the up and coming bands for John MacCalman (Radio Clyde producer & Jammy Records). Chris and Ron were filming the Kelvingrove Music Festival and the thing that stood out was the orange JVC video cameras, I thought they looked the business. They were feeding long BNC cables into the back of the stage into two low band U-matic mains machines the size and weight of a small horse. These days were the start of all our sore backs, I don’t know one cameraman who does not suffer from a sore back through years of holding and lifting various pieces of heavy video kit. Soon after that music festival I went for an interview with Flashback and was offered a job as a sound-man, as I had worked for Radio Clyde I must know something about sound, that’s the impression I gave as I was desperate to get into video production. Registration…in the early days of tube cameras we had to register the camera every time you transported it using a registration card. Tube cameras were very susceptible to go out of alignment, so you had to carry a small screw driver and a convergence chart. The camera had 4 small “pots” recessed near the front and you would look into the viewfinder and tweak the 2 colours till the lines converged i.e. These were not RGB what you were doing was aligning the tubes Blue-Vertical, Blue-Horizontal, Red-Vertical, Red-Horizontal… in other words all your black horizontal and vertical lines were totally black not fuzzy. During my 4 years at Flashback we eventually moved over to the Sony M3 camera this had the 21 pin connector into a High band U-matic Sony portable recorder. The lead acid batteries were a pain and the 1st thing you had to do when finishing a shoot was to leave the two ton tessie batteries on charge. Chris “Sony’s M3 camera offered the first really decent quality for industrial use. Actually a lot of these cameras were used for budget broadcasts around the world, although we were under no illusions that it was a broadcast quality camera. This was the first tube camera to give you auto registration, no more jewelers screwdrivers just point the camera at a registration chart, one press of a button and you were ready to go. The other thing the M3 had was a really good remote control unit (which as far as I know is still used for later cameras – we certainly used it for our later M7 one of the first industrial cameras to use a 3 CCD chip set). This facilitated multi-camera studio shooting with proper genlock, colour matching and remote exposure control. There was even a fairly sophisticated scene memory facility, only a little less capable than today’s Picture Profile settings on the EX camera range. 30 years of Flashback. FRONT. Me, Jan, Chris, Andy Cameron and Richard. We had some good times working for Flashback in fact sometimes it was hard to call it work ! There can’t be many people who can experience the birth of their trade, yet Flashback Video was one of the pioneers of professional video production in Scotland and I was a big part of it. Possibly our wackiest job ever was to produce an advert for Tunnock’s Tea Cakes. We had a small studio which had to be turned into a lunar surface, this is very hazy but I remember a lot of pyrotechnics going off at the wrong times, take after take after take and I can’t to this day remember what the end result looked like but a lot of paper mashie and matt paint should give you a better picture of our 1st break into the land of TV commercials. 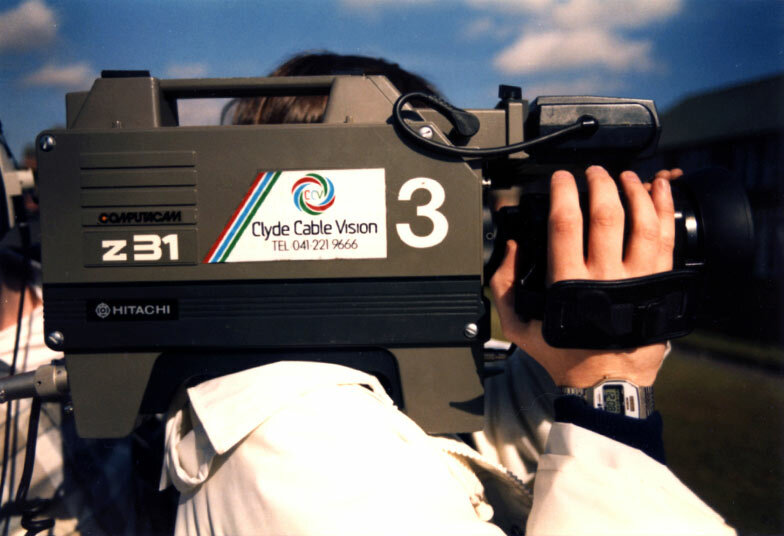 I decided during 1985 to apply for a job with Clyde Cable Vision a brand new cable television station, producing local content for the Glasgow Channel. It had been decided that the cable laying was to start with Drumchapel in the west of Glasgow. 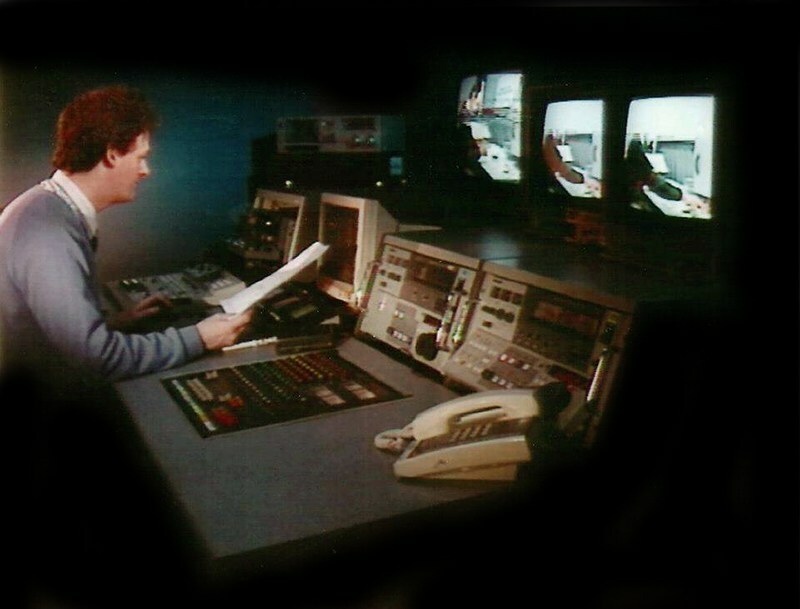 These were exiting times, the latest video equipment, three machine computer controlled editing using a Convergence system.We had a small studio with 2 Hitachi Z31 cameras both with Autocue. The 3rd Z31 was used for filming news stories out in the field. The Z31 was a 3 tube camera but performed very well indeed. As you can see from the picture below it was built like a tank. We had a busy schedule to fill, two news stories had to be edited for the 1pm live news slot and a further story in the afternoon for News Plus our 6pm live news magazine program. I vividly remember a breaking story that happened during 1986, I was sitting in the edit suite putting the final touches to a feature when I got handed a high band U-Matic tape from Ian, “look at this”. I nearly fell of my chair, it was a four in a block house that had disintegrated in a gas explosion just round the corner where I had lived only 6 months previous. 5 people were killed in the blast. We had a tie-in with Radio Clyde at the time who offered their news reporters if they were at the same news story. Brenda Paterson did a piece to camera for us and strangely in 1986 we let a lot of VT happen with no voice over so the viewer was left with the noise from the gun mic. 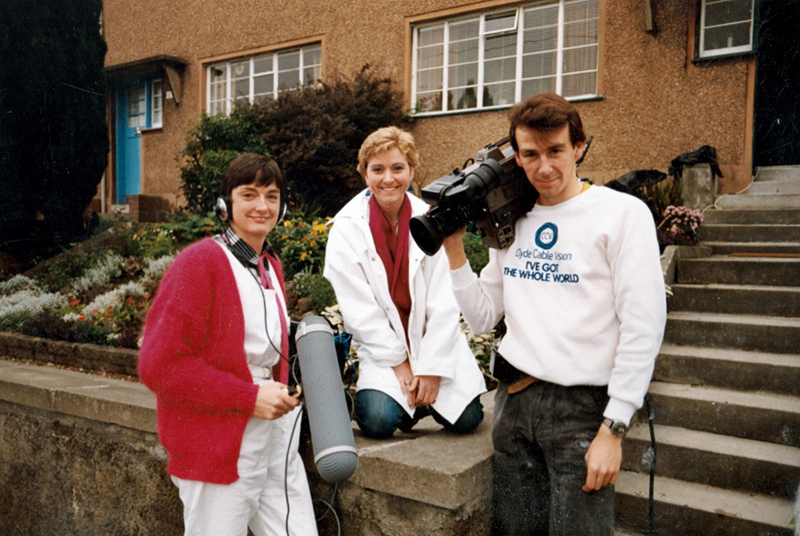 We were competing with STV and BBC Scotland at that time and I will always remember the amount of crew they sent out, Cameraman, Soundman, reporter, we all had these but the broadcasters also had lighting man, and director sometimes a runner. We were all multi-skilled in fact we invented the meaning of the word in the broadcast industry. We were also scorned upon from other crews, nothing less than social snobbery, they were better than us at least thats what they thought. We were again pioneers, I was a VT editor, soundman and in the studio a cameraman, sadly today it’s gone too far the wrong way, you have reporters making a hash of filming themselves with nothing short of glorified domestic camcorders, this might cut down on crew but it brings broadcasters down to the lowest common denominator and further reduces what was once quality television. Bean counters or accountants to you and me are to blame for the demise of quality television news in Scotland and it’s nothing short of a disgrace, especially health and safety which is now so compromised it’s an accident waiting to happen. Sorry I will get off my soapbox. 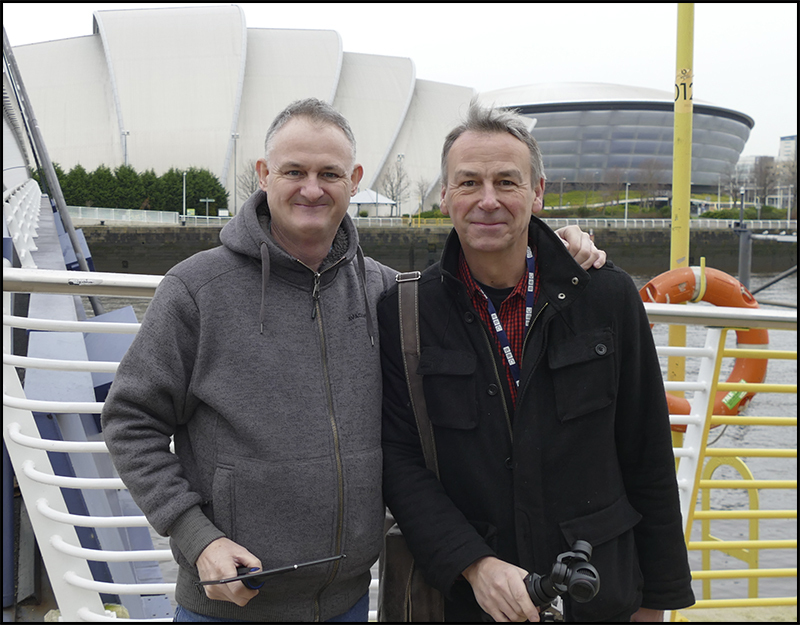 26 years later I met Ian, Clyde Cables cameraman at a large sensor day at BBC Scotland. Joice, Jenny and George somewhere in Durmchapel in Glasgow, 1987. 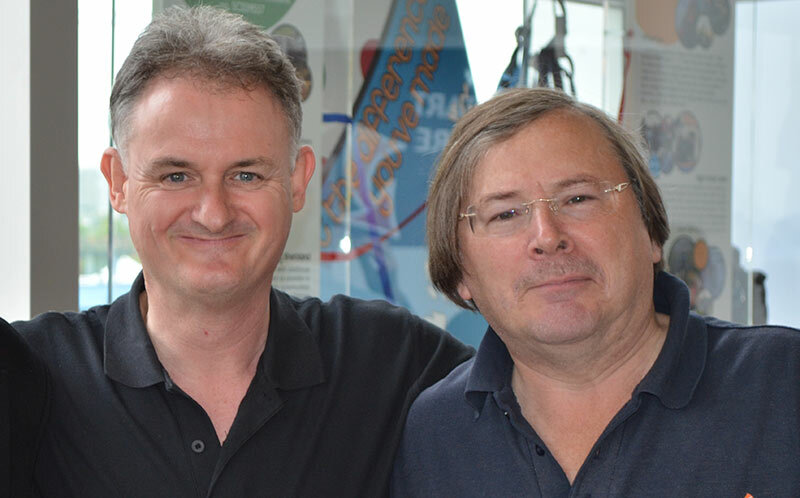 As I was about to use the DJI Osmo during December 2015 I bumped into my Clyde Cable Producer, George Cathro. Clyde Cable Vision took me to 1988 then I left abruptly to start out on my own. 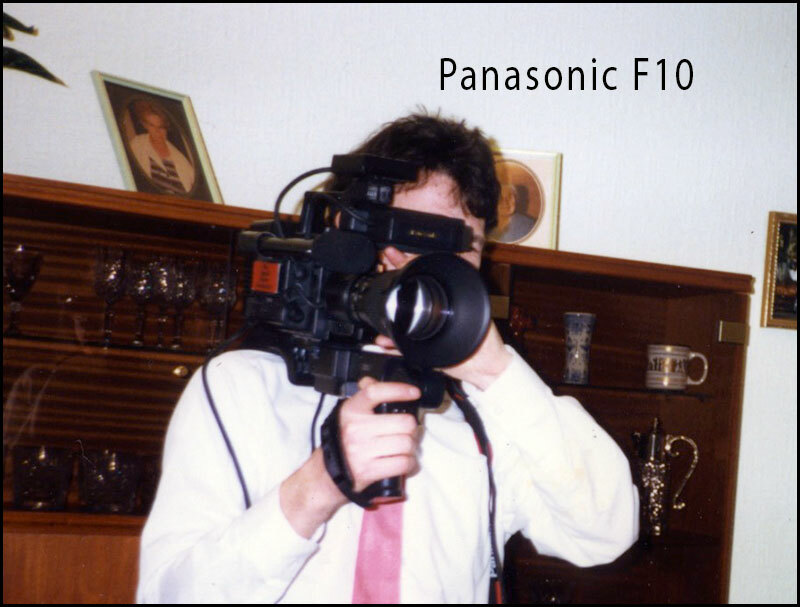 My first camera was a Panasonic F10 which was one of the first CCD cameras to filter down from the Pro range. The camera had a 14pin connector which connected via a 2 meter cable to an portable S-VHS AG-7450 recorder. 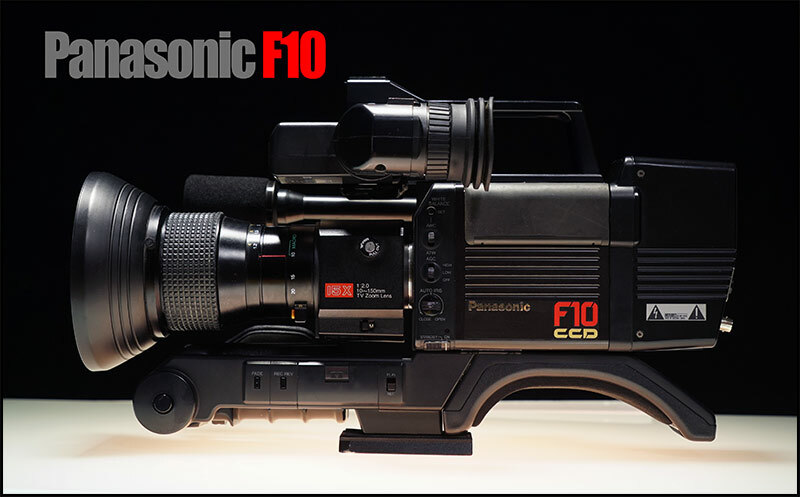 The Panasonic F10 was upgraded to the F15 which came in corporate grey colour. Grey is the colour that Panasonic decided was their professional look. 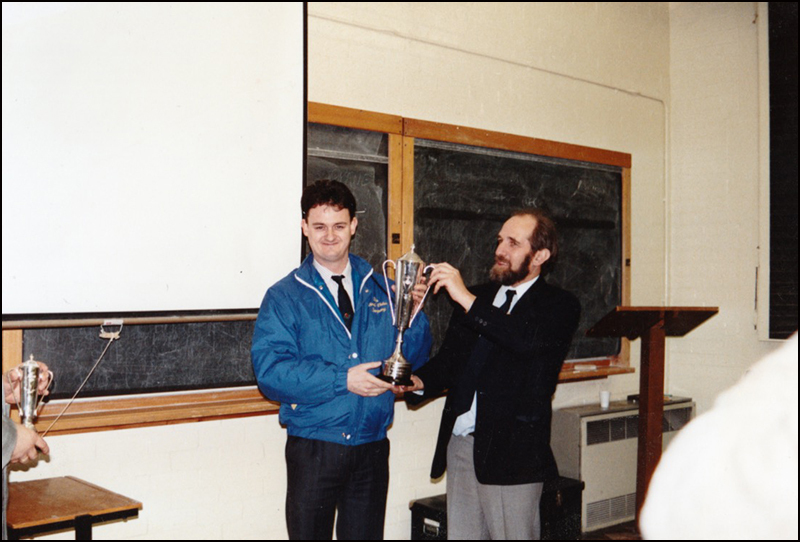 During 1991 three years after starting out on my own I won the “Best Video Production” at the Institute of Videography after becoming a member, I stayed with the IOV becoming a regional director and executive member but all the travelling to executive meetings meant I had to hand in my notice as it was taking a toll on my paid work. Surprisingly the F15 had a 2/3″ CCD sensor a horizontal resolution of 460 lines at centre and came standard with a 15x zoom lens, no reliable auto focus in these days. For the film look boys the F15 had an optional 35mm SLR adaptor and C-Mount lenses. We left Panasonic for a JVC GY-X1TC SVHS-C camcorder this was far smaller and lighter than the Panasonic and produced a cracking picture right out of the box. 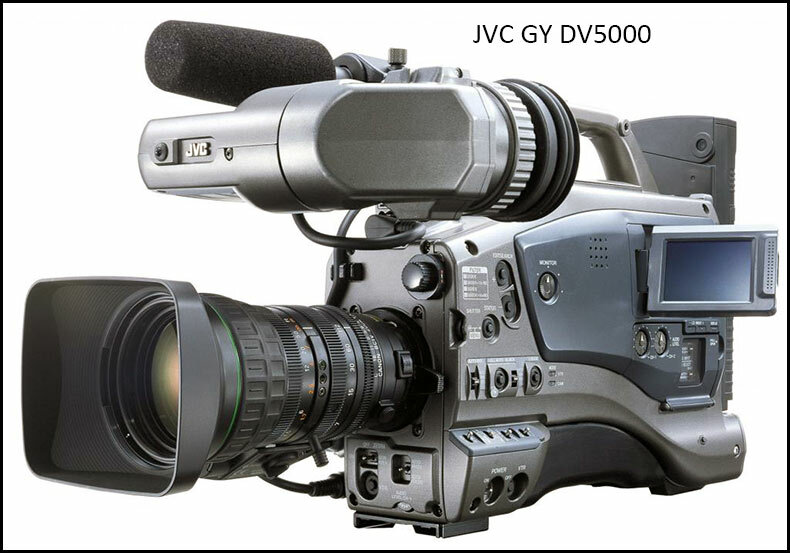 The JVC was our main camera for over 2 years moving over to Sony who had created a storm with a new technology called mini DV. The only camera available at this time was the Sony VX-1000 which had a 3 CCD chipset in a very small body. This was the first watershed in video technology Sony had produced a technology that would set the word digital on the map forever. I was absolutely stunned by the pictures this camera could produce but my professional pride was taking a bashing as this camcorder looked and was for it’s time …domestic. No more big cameras with manual lenses sitting proud on one’s shoulder, this was a major break from tradition but even then I had decided this DV format was the future, and until HD… this turned out to be true. 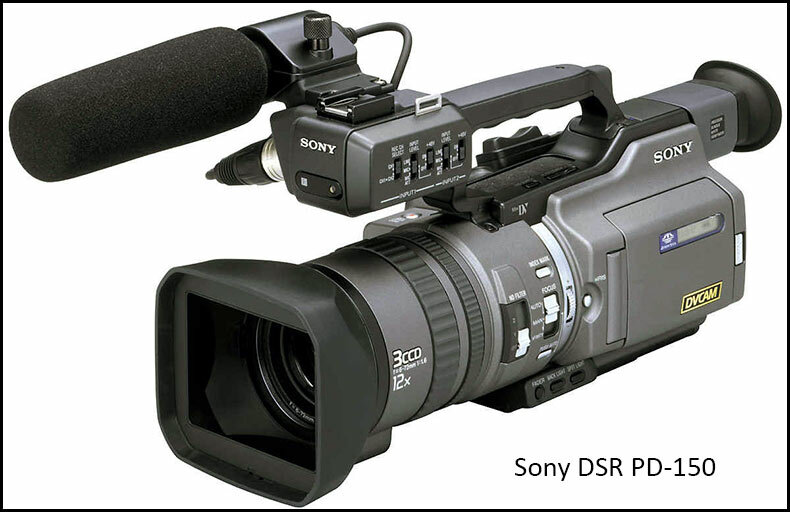 Fortunately Sony had also decided DV was the way to go and produced the DSR-PD150 with a hidden surprise. 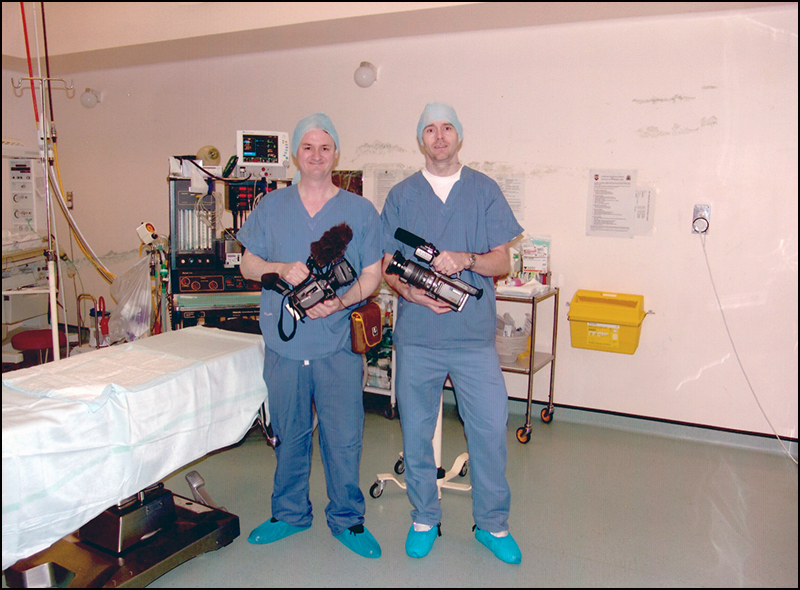 Me and Richard in our operating togs filming a baby being born with our Sony PD-150 camcorders. Queen Mothers Hospital in Glasgow. No one knew but the 150 had a very bad tendency to err on the magenta. This came to light when we started to notice people with ruddy complexions looked alarmingly exaggerated, so much so that I began avoiding filming close ups of guests who were too much on the red side. Fortunately for my productions and people with reddish complexions, Sony became aware of this and soon updated the camera to the DSR-170 which was far closer to a neutral white balance and had the benefit of being better in low light. The other important feature of the 150/170 was the phantom powered XLR inputs and the fact that it recorded in DVCAM mode. The next camcorder was probably my favorite to date the JVC GY-5000 Pro DV camcorder, it looked good, produced stonkingly good pictures but it’s achilles heal was a 4:3 picture. This was a good all rounder and was superb in low light. It was also one of the first pro camcorders to have a flip out colour LCD viewfinder. It was a joy to use and used not only mini DV tapes but standard DV tape up to 180 minutes. This was also the first camera I had owned that came with “V” lock batteries. Because of the 4:3 issue more people were looking for 16:9 footage we went for the Canon XL-2…major mistake ! The XL 2 had three 1/3-inch CCDs that delivered a true 16:9 image without the use of artificial letterbox or vertical stretch tricks. It’s one major letdown was the crap viewfinder. You could not find focus with this and after giving up my trusty JVC with Hi Rez black and white viewfinder I was in a land of true dispair. I don’t remember why I ever plumbed for the Canon…was it because it was white as most video cameras are boring black or regimental grey. The one thing about the early days of videography was that JVC had distinctive orange cameras and I loved this, cameras with attitude. I shot my first TV spot with the 2000 in Erie, Pennsylvania back in 1980/1981. I won a local advertising award for the spot for a hat maker…. after all these years I still remember how fun it was and is to pt together a nice piece of TV. Ahhh… memories…. sweet memories, Couldn’t agree more with the comments on the HVX200 it’s a brick, but I do love it all the same. (I have to I have one). I had a KY210 ohh the days, learned on a Hitachi F-21… and of course the m3, m3A, bvp 30 30P.. paid a fortune for these cameras. Tell me about it…I am still paying through the nose for video gear…it doesn’t help that the UK has such a poor conversion against the Yen and the Dollar. Wow, that’s a very young Tony ‘Bidders’ Bidgood! Thanks Simon I was wondering how long it would be till someone recognised Mr Bidgood, I am crap with names and could not remember Tony’s name. You can let him know he has gone down in the anneals of Sony history and if he cares to apologise for his poor predicting skills all the better. I recall walking with my XL-1 Canon and having someone ask, “Doesn’t that big camera get heavy?” And also thinking about puny the camera actually felt! After the KYs and M3s, then later, BVW Betacams, the XL felt tiny,indeed! Add that to the 9600 Avid that eplaced roomsfull of tape machines, switchers, ADO and monitors and… WOW! Then there were the Arriflex BLs…!When I started, we actually had some Sony (-non-C) 1″ recorders with a yardstick and a grease pencil… When the mark spun around the drum, you’d mash down on the big red “EDIT” button! -after unreeling 35″ of tape. Of course, in THOSE days, we shot all the remotes on 16mm. I also remember all that stuff introducing me to another post-millennium phenomenon: eBay! Boy does that take me back, I used a KY-1900e when I worked in Medical Illustration. We used to film operations… ah, them were the days. Prior to that it had been Bolex H-16’s…. I started in the wedding and event industry with VHS in 1983. The evolution was first single tube cameras attached by cable to a VHS recorder. 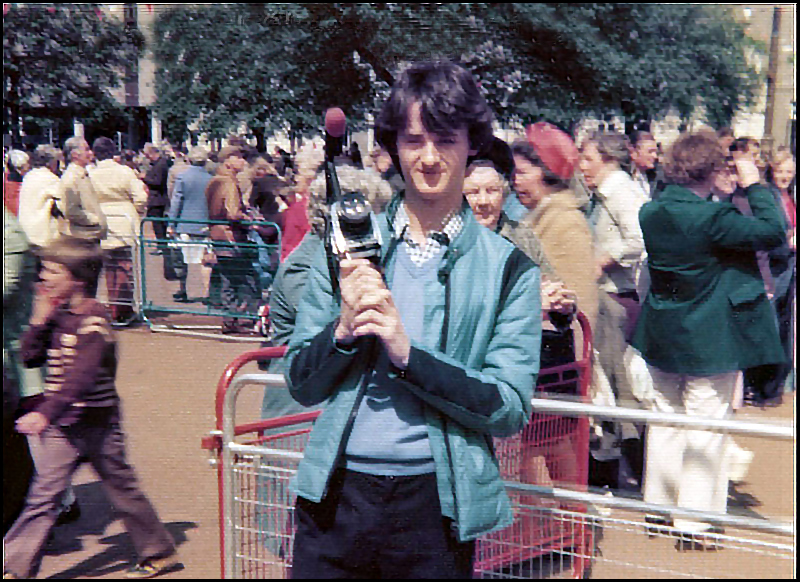 Then in 1986 or 1985, the first VHS camcorders were put on the market. There was a stigma to taping in VHS, given it was not “professional”. Correct, it wasn’t, but it was all wedding clients could afford. 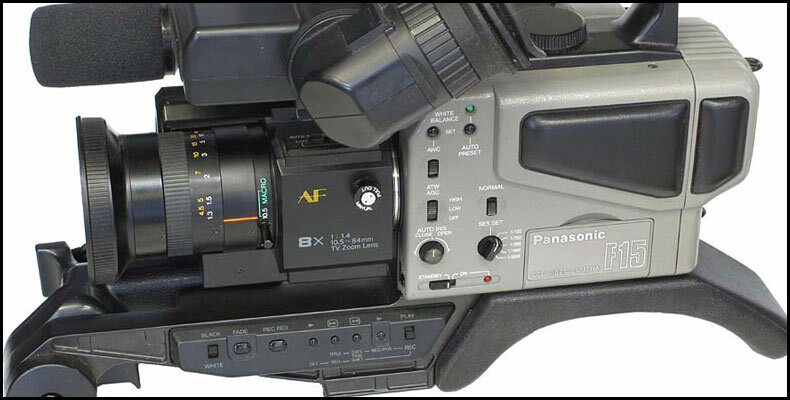 When Super VHS came along in 1987, folks in industrial video took notice because to many, its images looked better than 3/4″ with the added bonus of lighter weight field equipment. 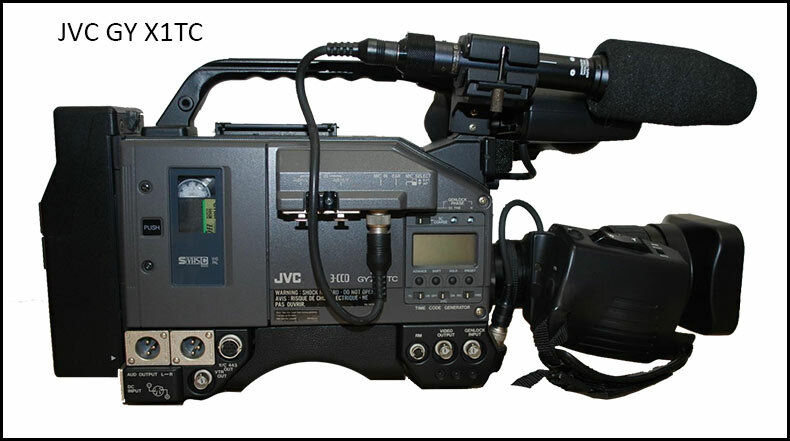 Once the DV and DVCAM and DVC-PRO equipment came on the market in the mid 1990’s, it narrowed the gap between event (wedding), industrial and broadcast. 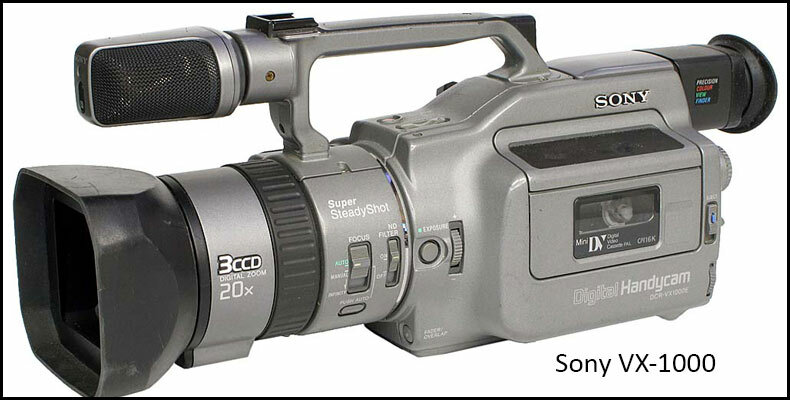 Now, in 2011, the consumer point and shoot cameras and particularly the HD ones I think rival the quality of some Betacam SP gear, but the jacks for microphone input are missing and the lenses are glorified “peep holes”. 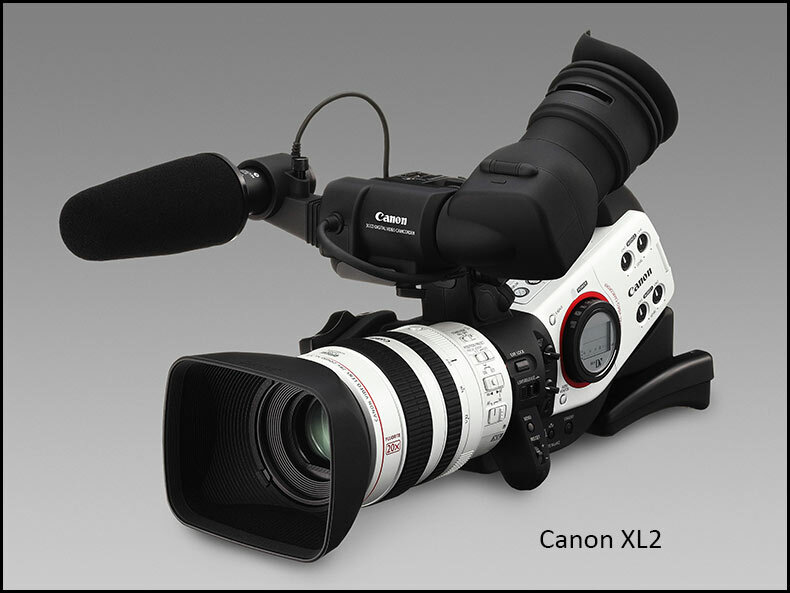 Nonetheless, the lowered weight, the lowered cost, the speed of capturing video for NLE post, it is all a new ballgame. The DSLR revolution is making for motion picture quality on what used to be a wedding videographer’s budget. To me, tapeless is a wonderful thing, no more video heads to get clogged, no more moving parts, less energy requirements. This was a great article, I loved it. Ah but do you remember shooting with a clockwork Bolex? 100 foot loads. 2 minutes 40 secs running time. Manual processing of the reversal film and drying above a gas heater? But I also do recall the KY1900 in my first video shoots in Auckland, and the “pigmatic” recorders. At least they weren’t as hefty as the Ampex VPR-20 “portable” broadcast recorders we moved up to when I started out in Hong Kong in 1984. Great article. Lots of memories. I actually started with a Sony 8mm handycam that back in the middle 90s already had a 16:9 option. It stills works and gives great “analog” colours! Although I have evolved to the RED ONE, I still love both my Sony 8mm and my superb Canon XL1. I have a pair of Canon XHA1s’s that I am looking to replace soon – and your critique of their XF305 gave me pause, because the XF300 is the camera I was looking at. I had seen and read very favorable reviews until yours. I don’t understand why Canon charges an extra $1,000 dollars (USA) extra for the bloody HD-SDI and genlok when other cameras make a point of including it. That has been my main frustration deciding on a Canon. I film mostly live entertainment events, simple corporate videos, an occasional wedding. I need a run-and-gun setup, but also want to do more artsy, shallow DOF stuff. I may do a documentary soon. Anyway, I would like a camcorder of that style, with 4:2:2 and 50 Mb/s capable, but as a 2nd camera would like something with interchangeable lenses. Maybe a DSLR. What a lovely journey through ‘camcorder’ memory lane! I’m with you all the way. Great run down of your personal history within the industry and the cameras that came and went. I agree….the JVC orange/red one visually was best…more color on the box as it produces within! Blimey Its like reading my own biography. JVC1900E in 1982 followed by M3, M3A, BVW400, Digi Beta 790, DvCam 570, PD150, XL2, Z7, and now my PMW350. Are we twins separated at birth? Why did you not opt for the Canon 5D over the Lumix for your IBC shoot? HDW : Canon have no interest in producing a DSLR fit for purpose, the GH3 I realise does not have a FF sensor, apart from that its streets ahead of Canon and Nikon. Mirrorless is the way forward and the GH4/YAGH combination will be the defacto interview DSLR of 2014. Hi Philip, I’m a self employed underwater cameraman. I currently shoot with a Sony Z1 and I’m still managing to get material broadcast but I can see I need to update soon. As you can imagine changing camera and housing is a big outlay and I have the dilemma of what to buy next without breaking the bank. You seem very taken with the GH4 and I’m wondering whether it might be the camera I’m looking for. I can see a lot of benefits with low light performance and broadcast standards etc. However I have concerns. I shoot with and without auto focus at present depending on how fast and how close the action is. The Z1’s autofocus rarely seems to lose target. I’m not sure how the GH4 would perform. Stability of the rig underwater is also important and sony’s steady shot has been a big help. Does the GH4 have something similar? Will the small size of the camera present me with added stability problems? I know you’re not an underwater cameraman but I would value your views on these aspects. HDW : 4K is a biggie for me its better than I was expecting although I use it for mainly cropping I can’t imagine how good a 4K underwater shoot might look. The 12.35mm f2.8 lens has POWER OIS (Optical Image Stabilisation). You can get underwater housings for the GH3 which by all accounts will fit the GH4. What is wrong with you that you cannot think outside of the 25fps/50hz/50i/50p fortress Europe box ? These cameras have other qualities in other frame rates especially higher. HDW : I live in the UK edit in the UK so whats your problem, what would I want to film higher than 50p unless I need a slow mo look ! HDW : If I had the choice with no money constraints I would choose the X200…3x 1/2″ chips are less noisy overall and especially in low light, you have to weigh the 17x lens (X200) against the 25x (X180), though I suspect the 17x is a better spec lens overall. In view of the disappointing 4K upgrade spec on the Sony X70, do you think the Panasonic HC-X1000 is the better camera to go for? but an awesome and diverse lens at that. For news and documentary work the 270 rocks ! PS If you want to get the very best out of the 270 do not lock yourself into the “PAL” / 50hz section open up your world to all frame rates. Interesting insight! I too started with the “KY” series cameras – mostly the KY-1900, 2000 and 2700 and also stuff like the Sony BVP-300, 330 and Hitachi SK91. I used to lust after a Ikegami HL-79, which was the dog’s wotsits at the time. It’s years since I’ve owned a video camera, but I’ve just ordered a X70 and can’t wait to start shooting with it. It’s nice to read the encouraging comments here. Thanks. Philip – thanks for all your great reviews. I’m currently looking for a camera to replace my Canon XF100 and just wondering why you got rid of you Panasonic 270? Any suggestions of what might be a suitable upgrade path – I’m looking for easy run and gun style with a good zoom (20x or more), separate focus and iris rings, ND filters and broadcast quality. I also use a GH4 so something that would match that footage would be good – it’s a minefield out there in terms of choice! HDW : I am not the right person to take cues from when it comes to new cameras. The Panasonic PX270 was a great camera, I sold it just before Apple brought AVC LongGOP to FCPX for a camera (Sony PXW-X70) that needs 3rd party software (Catalyst Prepare)…DOH ! For broadcast, run and gun the PX270 is just the job, one of the most under rated cameras on the market today, if I could go back in time I would still have my PX270.